K.K. Ataka Shōkai (安宅商会) was a Japanese distributor active in the late 1930s and early 1940s. From 1939, it invested money into Takachiho, predecessor of Olympus, and partly took control of the company. Its Tokyo branch became the distributor of the Olympus Six and Super Olympus cameras until the end of the war; the address was Marunouchi Yaesu Building (丸ノ内八重洲ビル). ↑ Advertisements dated June 1940, December 1940 and April 1941 reproduced in Hibi, p.63 of Kurashikku Kamera Senka no.8, mentioning the "machinery department" (機械部) of the "Tokyo branch" (東京支店) of Ataka. The June and December 1940 advertisements are also reproduced in Kokusan kamera no rekishi, pp.62–3. 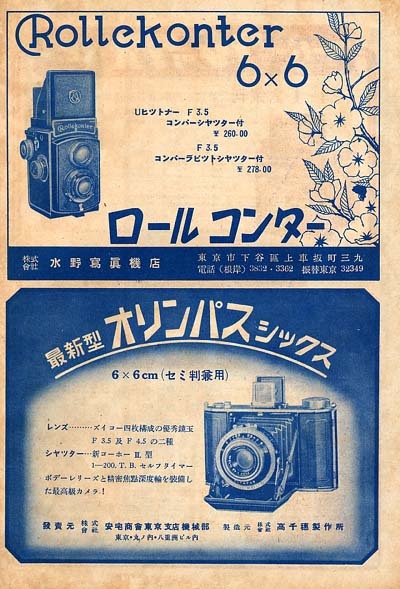 Advertisement dated 1942 or later, reproduced in Nostalgic Camera by Toshio Inamura. Advertisement on p.4 of Nihon Shashin Kōgyō Tsūshin, February 15, 1944, reproduced on p.68 of Hyaku-gō goto jūkai no kiroku. This page was last edited on 6 March 2008, at 19:29.